In this solo dining adventure, Gary has a burger at new to New York burger chain Elevation Burger. 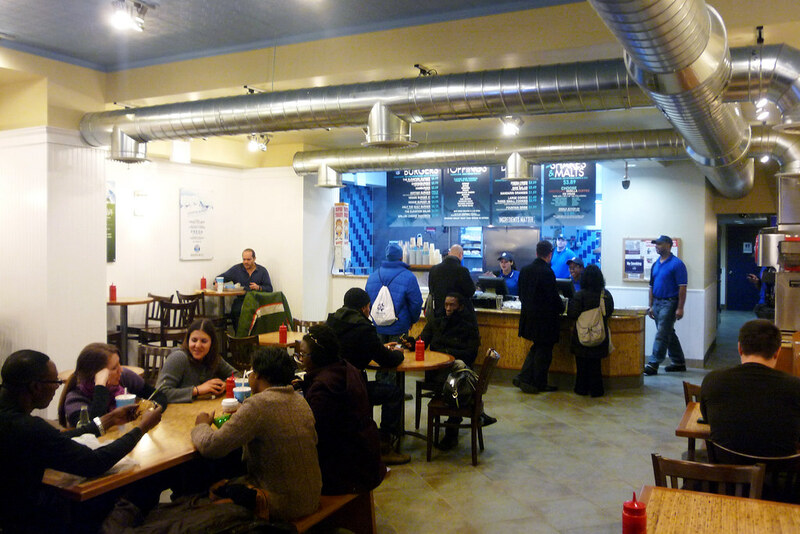 Just when you thought the burger proliferation in New York City couldn’t possibly continue, here comes Elevation Burger to continue the ever-growing burger footprint in this city. The Virginia-based chain hasn’t been around long – they opened their first restaurant in 2005 – but they’ve since expanded to six states and, with their expansion to New York, now have nearly 20 locations total. Their philosophy has all the buzz words we’ve come to expect from a burger joint – quality ingredients, organic, grass fed, environment-friendly. Their commitment to these ideas and principles are laudable but it comes down to the food, as it always does and as it always will. I went with their regular burger with lettuce, tomato, pickle, and raw onions. The burger was juicy, which I liked, but had absolutely no texture on the surface. Well, that’s not true – there was texture, just not the kind I like on a burger of this size. It was just too one-note with the burger looking the same inside and out. Surprisingly, I had a bigger issue with their toppings. They use iceberg lettuce which was cut way too roughly, leaving a giant, gnarly piece on top of my burger. The raw onions were sliced way too thickly and unevenly, making it difficult to keep them in the burger. All told, I ended up with a whole mess of raw onions at the bottom of the wrapper and the giant piece of lettuce was like biting into water, if that makes any sense. The fries here sure look nice; I just wish they were actually as nice to eat as they were to look at. They’re fried in “heart-healthy olive oil” – I don’t know if that made a difference but my order was decidedly not crispy enough. 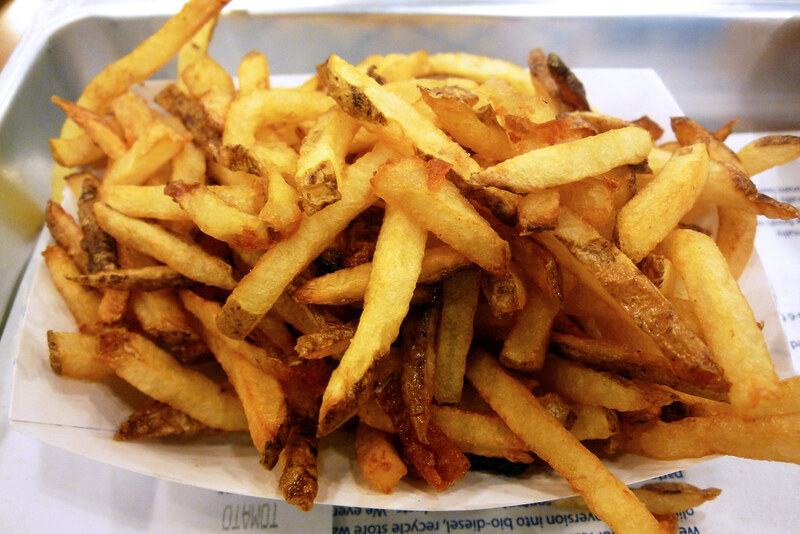 Some fries were crispy and fine but the majority were limp, somewhat lifeless, and, worst of all, had a tendency to cling together in one giant mass. They were, however, well salted before being served which is no small compliment when it comes to fries. 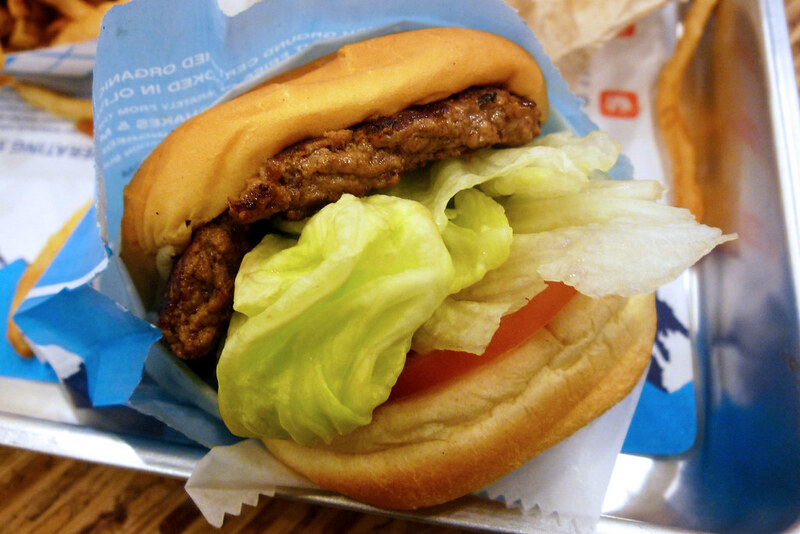 Elevation Burger makes a solid burger. Is it great? It could be if they got some char on the surface or some darker browning and if they did a better job at sizing their toppings so they don’t overwhelm the burger. The fries – man, I don’t know what they did wrong here but if they can just get them out when they’re crispy, not limp, they probably won’t clump together as much. Or maybe that’s just they way they do things here. I don’t know. Again, solid burger, mediocre fries but not many better options in the immediate vicinity will give these guys a chance to get their act together. Elevation Burger. 103 West 14th Street, New York, NY 10011. [Show/Hide Map] (212) 924-4448.